These overized round frames are made of premium acetate in various colours. They include flexible hinges and a keyhole bridge for your comfort. 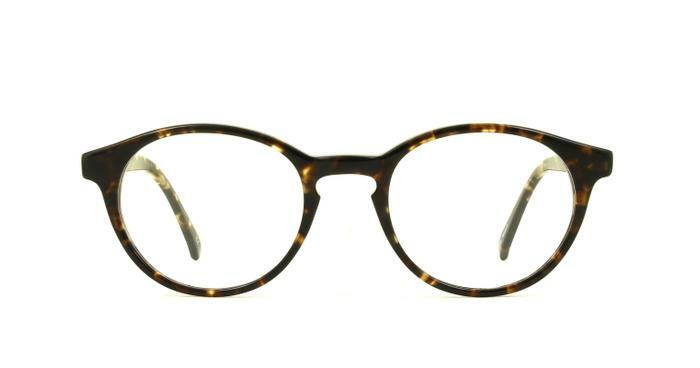 If you love our Fitzrovia design but find it too small, these are the frames for you. Frames have the size printed on the inside of the arms, with these you can use our Best Fit Machine to find a pair with the same fit as your own frame! Single vision lenses are designed to help you focus on things either near (“Reading”), far (“Distance”) or at arm’s length (“Computer” or “Intermediate”). If you need glasses to see both near and far, you may need Bifocal or Varifocal lenses. Bifocal lenses are designed to help you focus on things near and far. They provide a distinct separation between the distance and the reading part of the glasses, causing a visible line on the lens. The upper part is used for seeing at a distance. The lower part is used for seeing things close up (e.g. when reading). Varifocal lenses are designed to help you focus on things near and far, and everything in between. They allow you to see objects at all distances, and offer a smooth progression from long distance vision at the top of the lens, through intermediate distance in the middle portion, right through to very close objects at the bottom of the lens. Sunglasses lenses feature a UV400 coating which offers 100% protection from harmful UVA and UVB rays. To further improve visual comfort and reduce eye strain, we recommend Polarised or Transitions® light adaptive lenses. Digital Protection BlueReflect™ lenses are recommended for anyone spending a significant amount of time in front of digital devices (computer, tablet, smartphone or TV). BlueReflect™ lenses use a special coating to help reflect a portion of the blue light emitted by digital devices and artificial light. This coating also incorporates scratch resistant and anti-glare benefits, giving you clearer vision while using digital devices. Perfect and even better that I thought they would be. Great glasses, a little large but can easily get resized. Too many attempts, please try again in sec. I would like to receive exclusive offers and information on relevant products such as sunglasses and contact lenses from selected partners. Creating an account will allow you to save your recording and try out hundreds of frames whenever you want using our Virtual Try-On, even from a mobile phone or tablet.